The oral history booth during Cream & Crimson Weekend. Plans for celebrating the Indiana University Bicentennial are well underway, especially with the incoming Class of 2020 arriving this fall. Many Signature Projects have been designed for IU’s Bicentennial, one of which is the Bicentennial Oral History Project. 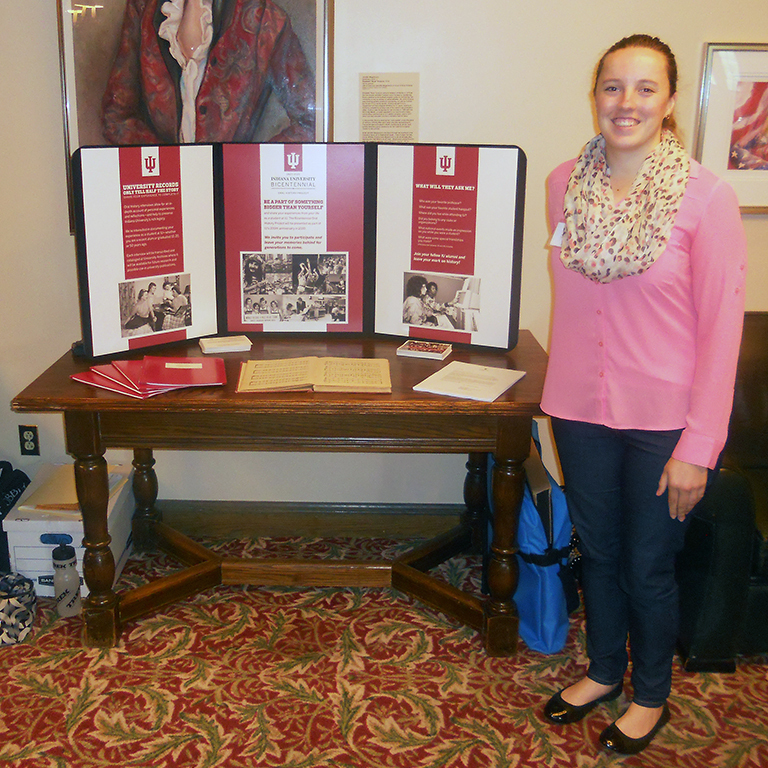 This project aims to collect histories from IU faculty, staff, and alumni university-wide. These oral histories provide a first-person perspective on the history of Indiana University available through no other source. The information collected from the participants can be used for research, teaching, and personal interest. Over 400 oral histories from IU alumni have already been collected as a part of this project. The Office of the Bicentennial and the Oral History Project Team are currently working to collect more oral histories and provide public access to them on the upcoming Indiana University Bicentennial website. The website will launch this week on September 9th. The oral histories are collected through individual interviews either in-person or over the phone. The Oral History Project Team also attends events, where large amounts of alumni, staff, faculty, or retirees are available to share their stories. Recently, the team attended Cream and Crimson weekend to talk about the project with curious alumni, as well as listen to and record their personal histories from their days at IU. Some of the most frequently asked questions we receive when conducting an oral history are, “Where will this recording go? Can anyone listen to it?” The oral histories collected for the Bicentennial will be uploaded, cataloged, and available on the upcoming Indiana University Bicentennial website, so that they are searchable and accessible to the public. The Oral History Project Team are working to implement software that will enable easy access to the oral histories collected for the Bicentennial. Many people often say, “I don’t really have anything interesting to share. You wouldn’t want my story.” We absolutely do want your story, and the interviewer will kindly walk the interviewee through the process before they begin recording. The interviewer will also ask a set of questions, so that the interviewee is not simply expected to talk on their own. Each individual story plays a significant role in filling an important historical aspect of Indiana University. The oral histories provide a wonderful opportunity to illuminate the peoples’ history of Indiana University from all campuses and from all angles. Harry Sax, graduating class of 1961. Indiana University Bloomington. Gloria Randle Scott, graduating class of 1959. Indiana University Bloomington. Michelle Sarin, graduating class 2009. Indiana University Bloomington. Sue Sanders, graduating class of 1981. Carlton Sanders, graduating class of 1972. Indiana University Southeast. If you would like to learn more about the project or share your story with us, you may contact Kristin Leaman, Bicentennial Archivist, at kbleaman@indiana.edu. You can also receive updates about the Indiana University Bicentennial by following their Twitter and Facebook pages.